Sunny, lounging on a Voodood rug from Jane's Island collection. Loom-inary . 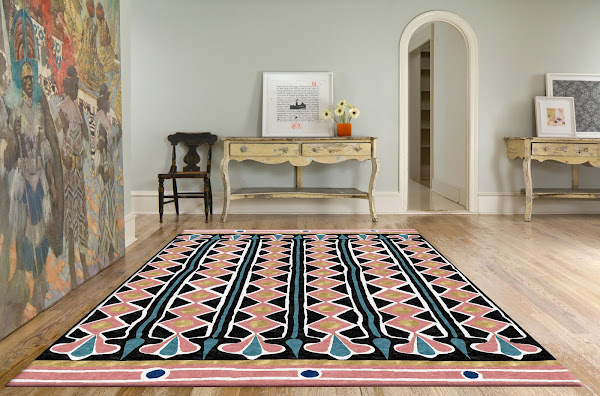 . . Dallas interior designer Jane Waggoner's stunning new rug designs are inspired by some of the world's greatest artists, including Picasso and Warhol. "Art inspires me at my deepest level," says Jane, who has dual masters degrees from SMU in art history and business. 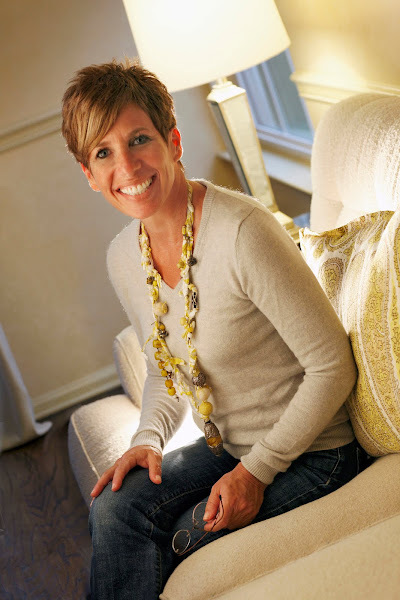 Her background is all about art, having worked at both the Museum of Modern Art in NYC and the Dallas Museum of Art, before starting her own interior design business. A passion for creating rugs was sparked two years ago, and her newest designs, Feng and Shui, can be seen in the windows this month at Forty Five Ten, which is selling the designs exclusively. Feng and Shui, from the Chinoiserie collection. Photo by Sean Gallagher. Stylemaker Dana Card introduced me to Jane late last year, while we were having lunch at Forty Five Ten. Jane arrived with her rug samples in tow, and her beautiful daughter Madeline, who was home for the holidays from UT. Madeline, who obviously has a natural eye for design, set up the shot above with the root table and green rug. Brilliant! Dana lent us her lovely home in Greenway Parks so we could shoot the rugs for this story. Her two standard poodles, Sunny and Louie, loved the camera and ended up in several shots. They're born hams, but I love how they look on Jane's rugs. Jane Waggoner. Photo by Peter Chollick (Jane's talented brother). The rugs, which are mainly wool and wool and silk blends, are hand-woven in Tibet at 100 knots per square inch, which according to Jane, is about as good as it gets in rug-making. They take about five months to make. I asked her how this is possible in a world that demands instant gratification, even on things that are supposed to be bespoke. "Some things are worth waiting for. Quality is worth waiting for. These are rugs that get passed down to your grandchildren, and my customer is the kind who values that," she says. The carpets also appeal to customers with a conscience. They're GoodWeave certified, which ensures that no child labor was used, and Jane donates 10% of the profits to children’s charities. But because it takes almost a half a year to get a rug, Jane's come up with ways to keep customers from going stir crazy. Midway through, they're sent a photo of their rug in progress along with a photo of the artisan working on it, “sort of like a sonogram,” she says. Special software, available at Interior Resources (the wholesale showroom that carries Jane Waggoner Rugs), allows you to upload a photo of your room and see what any of her rug designs will look like. Orani, from the Tribal collection. Photo by Sean Gallagher. Jane's designs are inspired by years of looking at art in museums, and travel. "I may not have the "it" handbag, but I always have a passport ready and a suitcase packed," she says. "Every 18 months I go to Europe for the architecture and the museums. 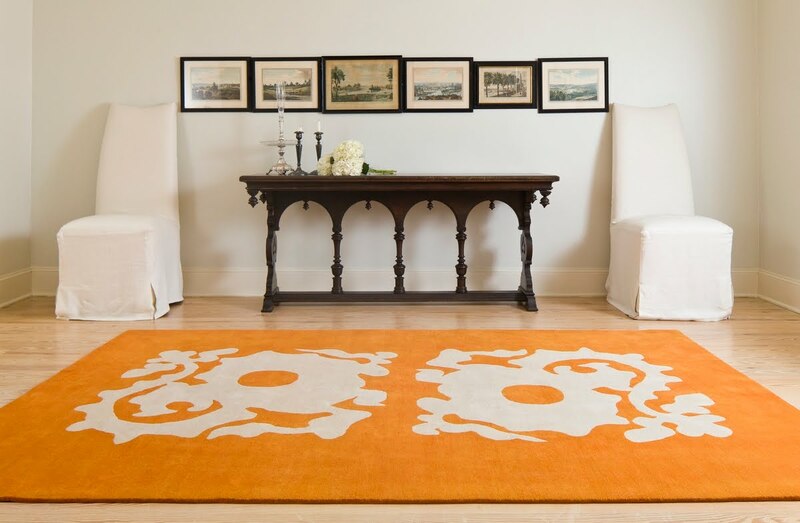 One rug design came directly from the detail of a frame in a museum in Spain. It starts out as one thing, then morphs into another." She particularly admires Picasso's Spain-influenced works, which galvanized her Barcelona collection. "Picasso's work, especially his ceramics, inspire something in me that's ageless and timeless. The litmus test for good art is that it can be used anywhere. That's the same test I use for my rugs. They can go into a variety of different places." Here's a snapshot I took of photographer Sean Gallagher on the floor, taking Jane's portrait with one of her rugs. I love how the trees outside cast decorative shadows on the wall behind her, and how Dana's living room has the kind of spare, washed out elegance of an Ingmar Bergman film. Louie, posing on a chartreuse Feng and Shui rug. Photo by Sean Gallagher. Eventually, Jane's rug designs will turn into designs for wallpapers and textiles, and she's working on some designs for iron and wood furniture with Shoshannah Frank. 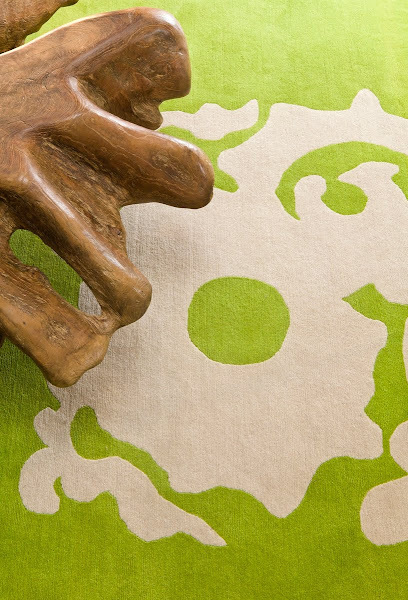 But for now, rugs satisfy the itch to create. "They satisfy a visual and tactile sense for me," she says. "I love the deliciousness of them, and the pile and feel of them."